A monthly Welsh language periodical that circulated mainly among the Congregationalists. The periodical's main content were articles on religion, literature and radicalism, with the periodical reflecting the opinions of its founder and first editor the minister and Radical reformer, Samuel Roberts (S. R., 1800-1885). 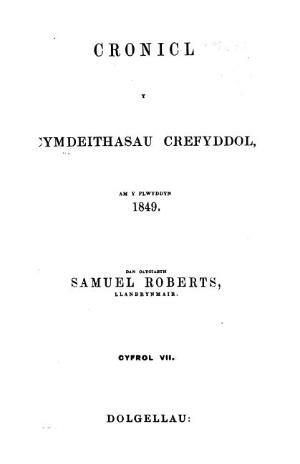 Samuel Roberts was followed as editor by his brother John Roberts (J. R., 1804-1884). Associated titles: Cronicl Canol y Mis (1871); Y Cronicl (1876).